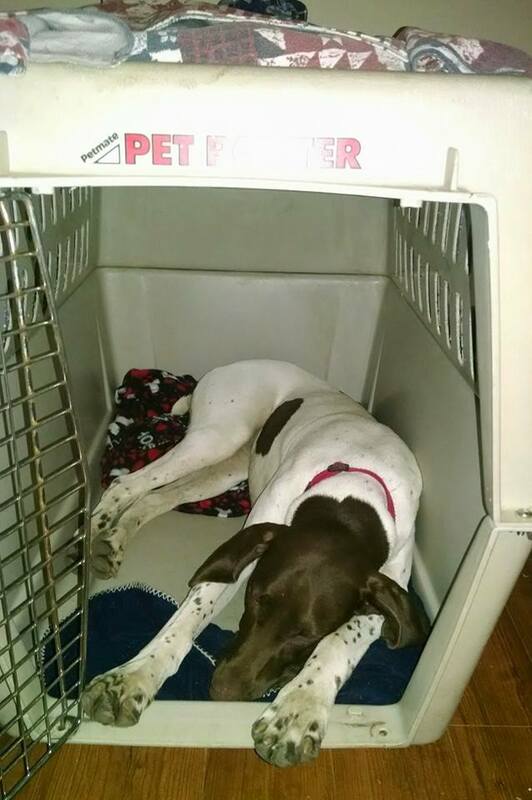 Paige feels safe in her kennel. Avoid when possible: Give the dog a quiet place to get away from the noise. This can be a room in the basement away from windows. This area will be quieter and eliminate windows where they can see flashes of light. In this room make a comfortable spot and include a radio or TV that you can turn on for background noise. If you can’t get far enough away from the sound they do make room darkening shades, ear covers, or sound muting cage covers. Some dogs will show us where they feel safe such as going into the closet. This is okay; make a soft comfortable place for them. This safe spot can be used at other times than during the storm. Link the spot with something good such as a favorite treat. If going into the kennel or to the safe spot is stressful when there is no storm, it will make the storm more stressful. Desensitization and Counter conditioning: CD’s or computer programs are available that have sounds of a storm. Playing this and slowly increasing the volume on a daily basis may help. When you play this sound, you need to start low enough so that the dog is not anxious. Link the sound with pleasant things such as eating, playing, or snuggle time. Slowly increase the sound as the dog tolerates it. You will not be able to recreate a storm completely, but this will help. Adaptil: This is a pheromone that is available as a spray, diffuser, or collar. It has no side effects. It sometimes works alone or works well will other medications. 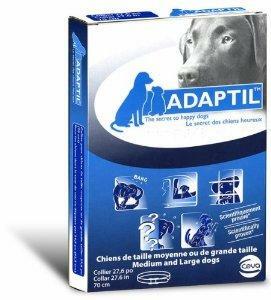 Click here for more information on Adaptil. Medications: This should be started if the phobia does not improve with the above treatments. These may help with training. The goal is to help reduce the anxiety to the level where the dog can learn the fear is irrational and be open to training. Medications may be given as needed for individual storms or they may be given daily. The length of time may be varied from weeks to months.